On sale this Wednesday July 29, 2015 from Marvel. "Reeling from recent events, even Hawkeye wants to know his new status quo. Who’s with him? Who’s against him? Who’s trying to kill him, and why? And just when Clint’s rock bottom couldn’t arrive fast enough, his brother shows up. After a lifetime of bad decisions, Clint and Barney Barton have to realize that they are brothers - and, ultimately, they’re the only ones who can save one another. If they don’t kill each other first." By Matt Fraction and me, colors by Matt Hollingsworth, letters by Chris Eliopoulos. Special art guests Francesco Francavilla, Chris Eliopoulos and Jordie Bellaire. 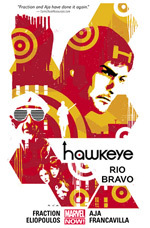 Collecting HAWKEYE (2012) #17, #12-13, #15, #19 and #21-22.